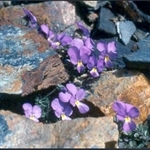 Dwarf species with purplish blue spurred flowers. Aquilegia bertolonii is a fine plant for the rock garden with lots of blue (slightly purplish) spurred flowers. It comes from southern Europe. Deep purple flowers. From the Pyrenees. Very small variety, with purplish pink flowers. Lovely white flowers speckled with blue dots. 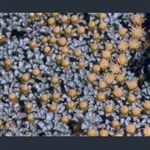 Mat of tiny, bright silver leaves, with clusters of tiny, yellow flowers. Beautiful wood anemone with double white flowers.